I was hoping for some feedback on my bread if anyone is willing! I mixed up the starter, some of the flour and all of the water one night, let it sit out for 4 hours then refrigerated overnight. Mixed the rest of the flour and the salt in the next day, kneaded in the bowl then stretched and folded 3 times half hours apart during bulk fermentation which was around 3 hrs. I then pre shaped (with a rest of 20 minutes) then shaped and put in the banneton then in the fridge overnight. I'm not sure how right I'm doing things or what to change when so any help greatly appreciated. Would love to know the recipe and what type of flour you used. why did you mix in all the starter the night before? did you preheat your oven and in what did you cook it? Dutch oven, cloche? How hot was the oven? I ask b/c I think your crust could've been darker and I hotter oven might have given darker crust as well as more oven spring. It's Trevor Wilson's 65% hydration sourdough.. Thank you not my very first but i'm finding my feet. It was just standard white bread flour from Lidl, so probably not the best. I am unsure where to go with flour and what is best to use so go with what is close at hand. Any recommendations for what I should use? I used a recipe by king Arthur bread which asks you to mix in the starter the night before. Would this be considered an autolyse? Still trying to get my head round everything but I've read since that an autolyse doesn't seem to have the starter mixed in? 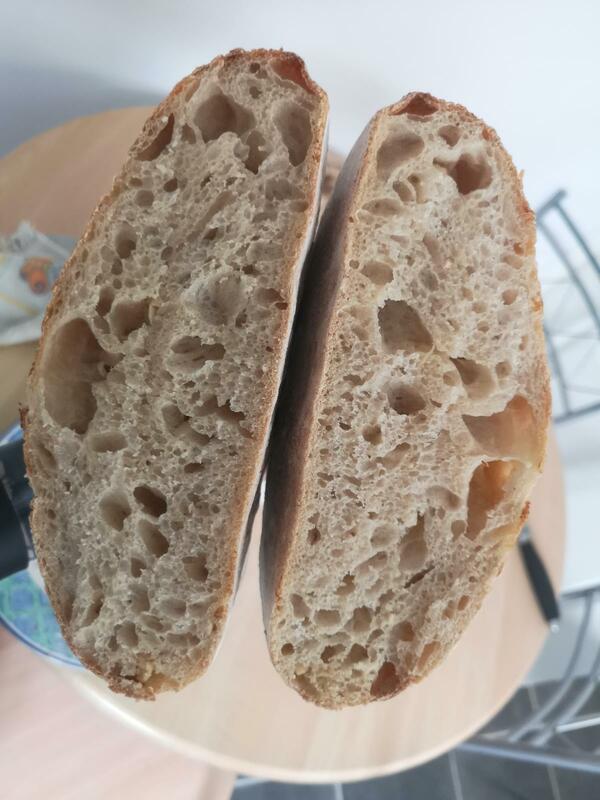 This is the recipe I used here https://www.kingarthurflour.com/recipes/extra-tangy-sourdough-bread-recipe but I added a little extra water around 20 ml and done my kneading and stretch and folds in the bowl instead of worktop and Refrigerated overnight once shaped . Definitely going to get a smaller banneton or use something smaller for second rise as I think it did make it spread too much. Yes oven was preheated to 230°c. Baked on a pizza stone preheated for around an hour. I put a large bowl over the bread for the first 25 minutes and then baked uncovered for around another 10. Perhaps I should have taken the bowl off sooner to help the crust darken too. My oven seal broke yesterday so It is definitely possible my oven has not been hot enough also. My goals are to bake sour tasting bread with a relatively open crumb, good rise and a nice crust. I would like to get better at understanding the dough and when bulk fermentation is done factoring in the dough being refrigerated overnight once shaped. I am also hoping to get better at scoring and getting my bread to open when it bakes. I suppose I want to understand the process more! Thank you i will check this out I have watched another Trevor Wilson video which was very helpful. I like the "sour" so I've invented my own method. I use the contents of a "probiotic" capsule that can be found in any health food or drug store. The probiotics ferment the dough creating Lactic Acid which makes the sour. It is a 2 step process and a yogurt make can be used or allow more time at room temperature. A portion of the dough is fermented 1st step and then the rest of the dough is added, 2nd step. The loaf should appear as a Ciabatta as does yours, which looks very good indeed. After the fermentation, and kneading and after the 1st rise, I place the dough on a well floured cookie sheet line with plastic cling wrap for the 2nd rise. After the 2nd rise, I flip the dough upside down onto another cookie sheet lined with parchment paper but you can also use the heated stone. Once the dough is upside down, i use my fingers to dimple the dough right through to the bottom. This distributes the gas production evenly. thanks you for all of the information! I love the sound of using the probiotic as an experiment. Does it have other effects on the dough as well as increasing how sour it is? It behaves like a Ciabatta. It behaves like a Ciabatta. Its a 2 step process: 1st; 220gm white flour, 253ml water, 1 1/2 tsp salt, contents of 2 probiotic capsules. Mix well and leave for 24 hours or 12 hours in a yogurt maker (my preference). 2nd step; Dissolve 2 tsp yeast in 65ml warm water. Pour the "fermented" dough into a stand mixer. Add another 220gm white flour and the activated yeast. Knead until smooth (May require a high speed on the mixer). Be sure to add the "fermented dough first. It makes it easier to mix. I prefer the yogurt maker because it guarantees the ferment. If you don't have a yogurt maker, put into a bowl and try to keep warm for the 24 hours. The temperature should not go below 21C. Cheers. Let me know if you have any questions on this.